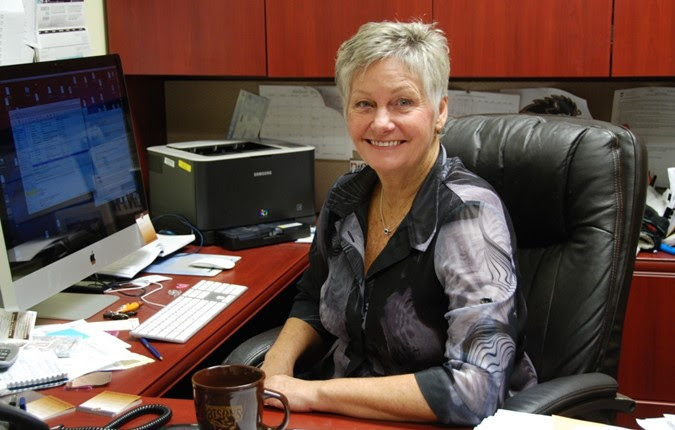 After 32 years at the University of Manitoba, Bison Sports Athletic Director Coleen Dufresne (MBHOF Class of '15) has decided to retire at the end of August 2016. "Coleen Dufresne has been an inspiring role model and advocate for sport on our campus, in our province and across the country," says University of Manitoba President and Vice-Chancellor David Barnard. "I want to thank her on behalf of the entire University of Manitoba community for her devotion and enthusiasm to Bison Sports and in particular to the thousands of student athletes she has impacted over the years." Dufresne commented about the decision: "I'm grateful to the University of Manitoba for having provided an opportunity for me to work in an environment with people who share a passion for sport. I feel privileged to have coached the young women who were a part of our program and to have worked beside such dedicated Bison Coaches and staff. As an Athletic Director in Canada West I have had the honour of working with the very best leaders in CIS Sport and I'm thankful to everyone for having been a part of my journey." Dufresne coached the Bisons to three Canadian Interuniversity Sport (CIS) National Championships in 1987-88, 1995-96 and 1996-97. Dufresne also led the women's basketball program to two CIS silver medals (1994-95, '97-98) and two CIS bronze medals (1986-87, '93-94) while having Manitoba in the CIS Nationals in 9 of 17 seasons and making the playoffs in 17 consecutive years. As Athletic Director at Manitoba for the last 15 seasons (named to the position at the University of Manitoba on June 8, 2001), Dufresne has overseen the addition of Bison women's soccer program to the list of CIS varsity sports offered at the U of M. She was also at the helm while four Bison teams won CIS championships and 9 conference championships. With a goal of providing high-performance environments to the student-athletes, Dufresne was able to secure full-time Head Coaching positions in Women's Hockey, Women's Soccer, Swimming and Track and Field, Assistant Coaching positions in Football, Track and Field and in Men's and Women's Volleyball. Full-time positions in Strength and Conditioning, Marketing and Sponsorship and Game Day Operations were created during her tenure. To compliment a highly successful Mini-U program, Dufresne was instrumental in the development of Bison high-performance and development programs through the Junior Bison programs and the Bison Athlete Development programs in strength and conditioning. In addition, there has been a record amount of Bison student-athletes who have earned CIS Academic All-Canadian status during her tenure: the 2013-2014 season saw record 103 join the prestigious ranks, bringing the total since 2001 to 1,057. Dufresne was a graduate of the University of Ottawa who went on to further her education at McGill University and at the University of New Brunswick. She is a former national team basketball player who represented Canada at the 1976 Olympics in Montreal. She then embarked on a highly successful coaching career, first at UNB (1980-84 where she was Atlantic University Sport Coach of the year in 1982-83, '83-84 also won CIS Coach of the Year in 1982-83). A native of Halifax, who is also bilingual, she was brought up in Dorion, Quebec, and her international experience patrolling the sidelines includes the World Championships and Pan American Games in 1999 where Canada won a silver medal. Dufresne has held numerous leadership positions at the national and conference level, including a number of roles on the CIS Board of Directors and a two-year term as Canada West President from 2005-07. As an International University Sports Federation (FISU) delegate on the International Control Committee starting in 2002, she has had the privilege to attend no less than five Universiades (University Student Games) and a pair of World University Championships over the past decade. On Nov. 17, 2005, Dufresne was elected to the FISU Executive Committee and is only the second Canadian to sit on this prestigious Committee. Other accolades and accomplishments for Dufresne over the years include being inducted into the Manitoba Basketball Hall of Fame as builder (2015), team-coach (2011, 2005) and team-player (2003). She was the recipient of YMCA/YWCA "Women of Distinction" Award in the category of Recreation, Sport & Active Living in 2005; Ottawa U Gee Gees – Hall of Fame Inductee as a player in 2009; Dufresne served on the board of Canadian Sports Center Manitoba from 1999-2014, the board of directors of both Canada West and CIS and is currently the Vice Chair – FISU CIC (eligibility) Committee. Dufresne's last day will be August 31, 2016. Basketball Manitoba and the Manitoba Basketball Hall of Fame would like to thank and congratulate Coleen on all her contributions to sport in Manitoba!